"The games IGA made in the past have reused sprites and assets, to make the game cost less to create, this would be a brand new game, so everything is new." I've been on vacation over the weekend and I got back just in time to find out about this before the stream started. Looks good to me so far. Character concepts look super lame. Other than that I guess it'll most probably play fine when it's done in 2017 or something. Surely that 1million$ mark will be reached in no time. First goal has been achieved, a bit faster than I expected. I guess we'll have David Hayter pretty soon lol. To be honest I'm kind of wary. Design looks like a meh version of Shanoa (she even has amnesia) . It could still be awesome but not sure for now. Also, it has some odd kickstarter stuff going on like "donate X and get a portrait on the wall" or kickstarter bosses, areas and weapons. Iga is Iga, but that sounds really suspicious. I just hope that music, gameplay and level design are good. When we get to see those I will lower my guard. Also also, they will have to work really hard to surpass Serio's drac. Design looks like a meh version of Shanoa (she even has amnesia) . It could still be awesome but not sure for now. Not a surprise, the game is made to attract Castlevania fans, so making things similar to Castlevania itself is a way to attract the fans. Also, it has some odd kickstarter stuff going on like "donate X and get a portrait on the wall" or kickstarter bosses, areas and weapons. Iga is Iga, but that sounds really suspicious. Yeah, that sounds annoying, if it were "just" extra things that don't change the game then it'd be fine, but paying more to get more weapons and fight more bosses is a turn off for me. Well, they hired Michiru Yamane, it would be a surprise if the music sucked lol. Level design, IGA says he'll avoid having repeated stuff (PoR and OoE had some very clear copy and paste rooms), but it's always better to be skeptical about those things. 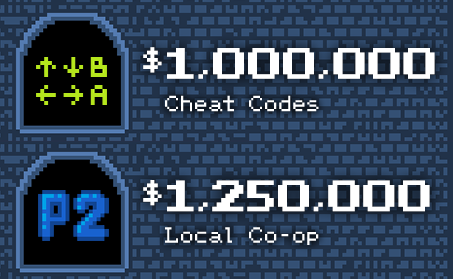 Aaand all (initial) stretch goals funded within the first day. Who's laughing now, Konami? The goal list was updated. And looks like it was updated again. 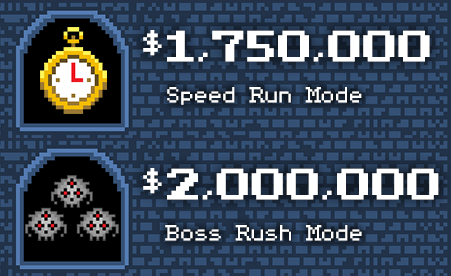 This time, with a New Boss and Speed Run Mode stretch goals. EDIT: It's almost at $1,5m right now. Iga certainly didn't expect THAT much support from his fans. I think the latter might be coming from that 8-hour long lifestream they had yesterday, 'cause there sure was some talking about speedrunning and such going on. How's that "Unlock the crystal lens" related to speed running? I didn't watch the whole stream so I might've missed something. It's about what hides beneath. It's possible to make out what the obscured text says just by looking at the very bottom (and the only somewhat visible part) of these hidden letters. Or, you could just say I like walking around with that Peeping Eye soul equipped. If you're right, you have a very good vision, I still can't see it lol. It reached 1,500,000$, new boss confirmed. You were right, and apparently there'll be a boss rush at 2,000,000$ now. Now that I think of it, won't the special backer edition have an extra boss? Will he be included on that edition's Boss rush or will he just not be there? (Like Jiang Shi in OoE).